With 22g of high-quality whey protein and only 6g of sugar, our Peanut Butter Chocolate protein bars deliver the goods, along with a rich and naturally sweet flavour that truly satisfies. 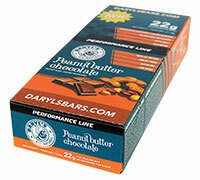 Savour this smooth blend of chocolate and peanut butter guilt-free. We've left out all artificial colours, flavours and sweeteners; and instead, rely exclusively on real peanut butter and real dark chocolate to achieve an authentic, enjoyable taste. Our Performance Line protein bars do not require refrigeration. You can freeze or refrigerate them to maintain their freshness longer. If you notice your bars seem less soft or moist than usual, try warming them up in a microwave for 10 seconds. But remember to remove the foil wrapper first! *Peanut Butter Chocolate Flavour Shown. 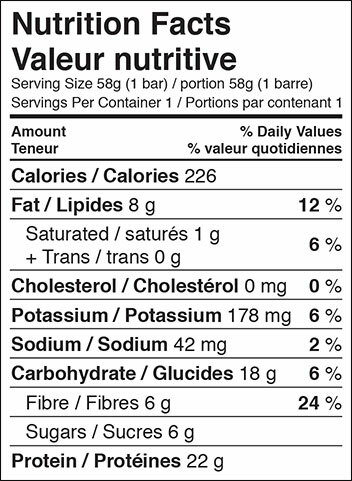 Ingredients: whey protein isolate, peanut butter, prebiotic fibre (IMO)*, chia seeds, quinoa flakes, hemp hearts, golden flaxseed, honey, natural vanilla extract, dried sweet potato, natural peanut butter topping (sugarcane, palm kernel oil, partially defatted peanut flour, nonfat dry milk, peanut oil, non-GMO soy lecithin), natural dark chocolate coating (sugarcane, palm kernel oil, cocoa powder, whole milk powder, non-GMO soy lecithin, salt), rice extract.